Support our club and be there to meet her. She's an outstanding speaker and passionate about Rotary and our District 6970. Jeanette joined the Rotary Club of Flagler County in 2004 after relocating with her family from Forked River, NJ where she became a Rotarian in 1997. Jeanette was club president in 2009-10 and began serving District 6970 in a variety of positions including District Secretary, District Trainer, Area Governor, District Grants Chair, in a number of committees. 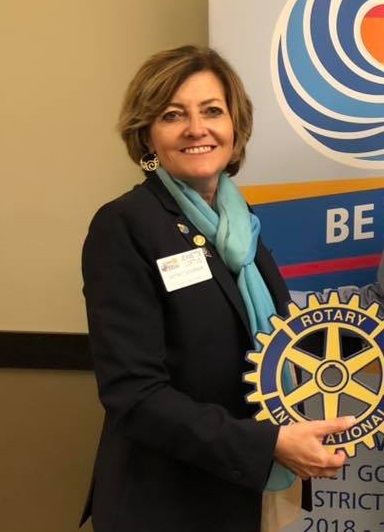 She has also served as PETS Trainer and remains a Rotary Leadership Institute Discussion Leader for the Sunshine Division where she has served as District Director and Faculty Coordinator. Her passion is Rotary education and believes an educated Rotarian is a Rotary valuable asset. In January 2017, Jeanette traveled to India and had a once in a lifetime opportunity of participating in a National Immunization Day just outside of New Delhi. The Loftus family has had the pleasure of serving as hosts for Rotary Youth Exchange on three occasions and has been enriched by hosting several GSE Team members. Jeanette is a multiple Paul Harris Fellow, a member of the Paul Harris Society and the Bequest Society. Jeanette spent much of her life growing up at the Jersey Shore where she met her husband of 34 years, Tracy at the age of 9. After participating in Rotary events for over 15 years, Tracy himself became a Rotarian and is the Immediate Past President of the Rotary Club of Flagler County. Jeanette and Tracy have been blessed with two children, Timothy and Zachary and two granddaughters. Both boys have served Rotary alongside of their parents throughout the years. Timothy was a Charter member of the Rotaract Club of Flagler County and Zachary is Past President of his Interact Club, has attended RYLA and is currently enrolled as a Sophomore at Valdosta State University. And, four-year-old granddaughter Emma Grace participated in her first Rotary service project this past year. Rotary’s ethics and values run deep in the Loftus family. Jeanette is a Realtor® with Palm Coast Real Estate where interestingly and not by coincidence, her business partner, Bill Lyon is also a Rotarian and Past President. Prior to a career in real estate, Jeanette spent much of her professional life in the banking industry where she specialized in new branch openings, business expansion and staff development. In her childhood years, Jeanette was a Girl Scout earning the highest rank of First Class Scout and went on to serve Girl Scouting as President of the Ocean County Girl Scout Council for three years and remains a Lifetime Member of Girl Scouting. Jeanette is currently a member of the Flagler County Association of Realtors, the Flagler County Chamber of Commerce and serves the community in a variety of other capacities whenever possible. The entire Loftus family are founding members of Beachside Community Church in Palm Coast. The Loftus’ cherish their time with family whether it be boating on their pontoon, sharing a Sunday family dinner or participating at a Rotary function. Family time is their most precious commodity. When not busy with family and Rotary, Jeanette’s hobbies include boating, cooking and travel.